The design and manufacture of piston rings is probably more complex than that of pistons. Because the quantities manufactured by us are relatively small, the process is the old fashioned way using spun cast materials. This process differs from the large volume producers who manufacture piston rings by individually casting each ring. However, although this is time consuming the end result is still a high quality ring. All types of ring are manufactured and are used by engine manufacturers in conjunction with our pistons for Paris Dakar Rally, World Rally Car, Touring Car and World Super Bike racing. 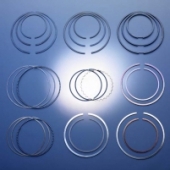 The aim of our piston ring department is to produce only rings that are not available from specialist manufacturers or for small batch production that these manufacturers do not or, do not wish to make.